"The Lottery" is a thriller (horror - 100 mn), diffused on NBC on September 29, 1996. The director is Daniel Sackheim, with Anthony Spinner's scenario fired by the Shirley Jakson's short story, published in the June 28, 1948 issue of the New Yorker. Executives Producers are Lee Caplin and Allan Landsburg. Music is from David Mickael Frank. Synopsis: On his deathbed in the hospital, Jason's father asks that he be buried in the town from which he came, beside the body of his wife. Jason, who came to the city with his father at a young age, remembers little of the town or his mother, but he undertakes the charge. It is an idyllic place, but gradually snips of memory return, until he remembers the significance of the fact that most of the tombstones in the town cemetery, including his mothers, bear the same day and month, one death each year. Caught up in the memory of the lottery he saw as a child, and the one he is trapped in today, escape is difficult. This is a good movie. Throughout the whole movie you know something really weird is going to happen. There's just this feeling. Unbelievable ending. If you get a chance, watch it. To all who think that the ending is sick and pointless, that was Ms. Jackson's intention exactly -the original story is an allegory about the cruelty man inflicts upon his neighbor in the name of upholding "tradition". This current day (90ish) version of "The Lottery" doesn't do the original (1948) short story by Shirley Jackson justice. However it is an interesting modernized version of the short story, with a modern day twist. For anyone who hasn't read "The Lottery" it's a great short story. It starts off as a pleasant story which could have taken place in any century. Once she has you hooked, the story takes an unexpected turn. 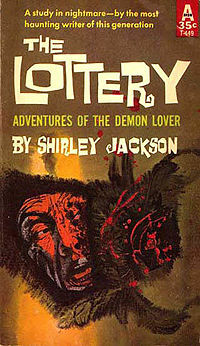 If you like Edgar Allan Poe, you'll really enjoy Shirley Jackson's original story "The Lottery". Regrettably, no photos of Sean extracted from this TV movie.